The conference was held at the Queen's Museum in Queens, New York. I presented Crankies: The Resurgence of Moving Panoramas in the 21st Century. It covered some of the ways crankie artists around the world are using this art form. This "Power Pointless" presentation was delivered using a crankie. In the early 1960s, Peter Schumann made a moving panorama and named it a "cranky." This started the first wave of the cranky-making revival. 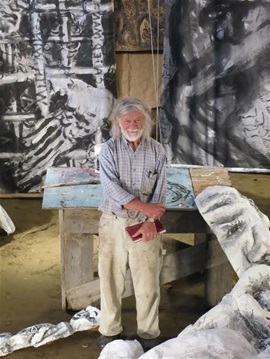 Read more about about him in the article Talking Rye with Bread and Puppet's Peter Schumann. From England, Kathy and Andrew Kim have created one of the most imaginative settings for a crankie. 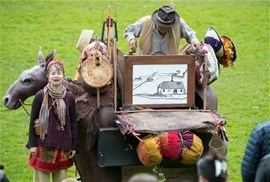 A life size pack mule is loaded with suitcases, pots and pans, miniature puppet stages and a crankie. Each prop tells a different story of migration, past and present. From Ashville, NC, Lisa Sturz created a crankie to tell the story of her grandfather, Cantor Izso Glickstein (1890-1947), a Jewish Ukrainian prodigy who settled in Boston. The crankie scroll symbolizes the Torah. Also included are shadow puppets, mixed media images and audio recordings of his powerful singing. To read more follow this link and watch the video below. Crankies are being used in a therapeutic way, formally and informally, to process difficult events or experiences. A month following the 2015 uprising in Baltimore, a response to the death of Freddie Gray, Elizabeth McKenzie Ditter and Matt Muirhead made a crankie with a group of middle schoolers from East Baltimore.They asked them to share their experiences and what changes they would like to see in their city and in the world. Vist their websites. Watch the video below. In Minneapolis, artists Molly Van Avery and Mike Hoyt designed and built two crankies that work as a mobile engagement tool. 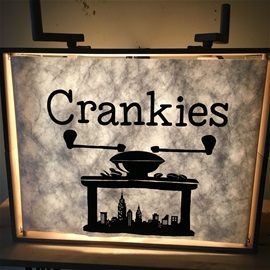 Mike Hoyt would load the crankie boxes into a three wheeled bicycle and bike them to community events such as picnics, shopping malls, and concerts. They would invite people to crank the crankies to see images of Minneapolis past and present and then draw or write their ideas about a Minneapolis in 2040 that is healing and reconciling from the negative impacts of inequity. The ideas and feedback generated by the crankies was given to City staff for the Minneapolis 2040 Comprehensive Plan Update. To read more, click on this link, watch the video below. John Bell, Director of The Ballard Institute and Trudi Cohen perform a crankie at a mini crankie fest at the Univ. of Connecticut. Crankies are being used in many educational settings. Librarians are adding a crankie to their bag of storytelling tools. Teachers from the kindergarten level through high school are usings crankies to develop skills in language arts. One example from a university setting is The Ballard Institute at the University of CT where students can earn a masters degree in puppetry. 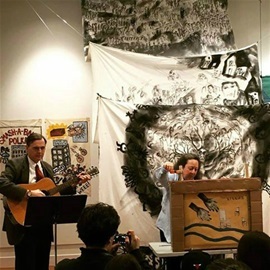 In 2017, the school hosted the first ever exhibit of crankies from artists across the country entitled "Banners and Cranks" Paintings and Scrolls in Performance." Dr. John Bell, Director of the program, has a foot in "both crankie worlds." He wrote an academic paper on 19th century moving panoramas and also performed with the Bread and Puppet Theater for many years, giving him exposure to crankys. Read more about the The Ballard Institute in the article below. Grand Opening of :"Banners and Cranks: Paintings and Scrolls in Performance"